Anglers love to catch fish! Can the community work together to catch 10,000,000 lb's in weight of any fish by 25 April to unlock a Dovetail Fishing League T-Shirt. I went pike fishing again this week, and blanked. I missed a run within the first half an hour, but otherwise, my indicators stubbornly refused to move all day. All was not lost though, as I met two anglers, one of whom was also fishless in his pursuit of predators, and his son, an exceptionally polite and well mannered fourteen year old. After a quick chat with dad, I spent a few minutes with the younger angler, and watched as he flicked a lure up the side of some pontoons in search of perch. We discussed the merits of dropshot and jig fishing, and I was pleased to see him pick off a solitary perch, indicating that it may be an area worth further investigation, so with that in mind, I said my farewells, and resolved to return later in the week… I have only ever fished with bait at this venue but wanted to find out if perch were worth targeting on lures. Determined to kill two birds with one stone, a few days later I was back at the water with the brand new Deeper Sonar™ Christmas package to do some product photography for one of my sponsors, and put the kit to the test. I’ve been using Deeper for a while now, and the new Deeper Pro+ is a real upgrade on the previous incarnation, with connection issues resolved, more features, and a greater casting range achievable. I tend to use it solely to confirm or locate underwater features, rarely utilising the fish finder option, but I wanted to try both for the required images. Whilst deadbaiting the water for pike, I’ve suspected an area of weed amongst a relatively clear lake bed, and this was an ideal opportunity to prove that fish were indeed holed up in cover. The Deeper is so easy to use; simply install the app, drop the sonar into the water (water activated battery) and wait for it to connect. At this point, I should point out that turning off mobile data gives far better connectivity, and within a few seconds, an image will appear on your phone or tablet which clearly depicts the environment below. Once stabilised, the picture will scroll across the screen, so you can pick out features, fish, temperature, depth, and plenty of other variables; it certainly makes mapping a water a far less laborious evolution than constantly casting a marker float. You can also store the information in the form of a GPS accurate map, add your own notes, and even add a photograph of the exact spot where you stand! Brilliant! Camera tripod locked in place, remote control in hand, I set about getting the requisite amount of shots for social media and marketing, including screen shots of actual use, and after an hour of repositioning, deleting, retaking, and viewing of images, was happy I’d got enough to work with; it was time to map some spots. My Deeper is attached to 50lb braid and it was quickly hurled out as far as I could cast it. I’d be lying if I said I could it to the maximum stated range of one hundred metres, (although I have used it to map river swims as it trots downstream) but then I don’t tend to fish deadbaits at that range either, so knew I’d have my spots covered. I waited for the picture to clear, and slowly wound in, pausing every few seconds to let the Deeper hover over areas of interest. I picked out a known snag with ease (pesky thing) and marked it on the GPS, then continued to retrieve over the potential weed patch. It was vegetation, but I was surprised just how far off the lake bed it rose. What I thought was perhaps a thin sheen of silkweed turned out to be substantial growth and a good depth of silt beneath. My baits had perhaps been landing in the silt which spread some distance from the focus of the weed, but at least I could confirm that the obstruction was there; noted for future sessions! I did have the fish finder turned on too and wasn’t surprised to find a good number of fish within cover. Vast areas of the reservoir were completely devoid of fish, a change in the weather had certainly stirred them up and at the base of the shelf, where I’ve caught a good number of pike, there were none! The majority were either in the weed or patrolling in mid-water near a shoal of bait fish, identified as a scatter pattern which was studded with ‘proper’ fish reflections. I spent another hour mapping the whole bank, finding depths to almost thirty feet, the remains of an old dam, another snag, and more fish, before packing away and having a quick fling with the dropshot rod under the floating pontoons. It proved to be slow going, with only a handful of perch caught, but the chill wind put paid to any further fishing, it was just too cold! I moved off to a tiny local river, determined to bank something worthy of a photograph. I’d changed the dropshot set up for a 3g jighead, loaded it with a pink Spro lure, and slid into the cramped swim beneath the trees. I’d seen a fish rise whilst approaching, so was confident of a hit on the lure. The river contains chub, trout, pike and perch, so it’s a real ‘lucky dip’ which is part of the reason I enjoy it so much. I prepared my first cast, carefully checking that my braid wasn’t looped around the end of the rod, my bale arm was open, that the backcast was clear of obstructions, and that the spot I wanted to cast to was accessible. All clear, I fired the lure out and it went straight into a tree which had a single branch hanging down! With 6lb braid and 5lb fluorocarbon, snatching it back in isn’t an option, so by the time I’d gently pulled the branch towards me, I’d made far too much noise to have any chance of a fish from the tiny swim, so scrabbled back up the bank to try the next glide. A classic small river swim, with fast water running into a widening, deep pool, it’s one of two spots here that are ‘guaranteed’. I know every nook and cranny and can tell you at any time of the year where fish are to be found, I’m that confident! The pink shad was twitched across the bottom, repeated several times, but without success. A change to a similar pattern lure in a different colour bought an instant bite, a handsome perch of around half a pound the culprit, and this continued with a number of fish banked. As I watched the rod tip, I noted a splash against the far bank, just a few yards distant, and watched a long dark shape slip by beneath the water. The clear water gave me a good view of the intruder, and I quickly realised that it was a mink, which I watched surface and swim to its home within the roots of a tree. We watched each other for a while, the mink’s pale snout clearly visible in the dark confines beneath the tree, and I have to admit that I was enthralled to see an apex predator up close. I know they are killers, but what an impressive animal, and a real treat to witness! I didn’t want to risk conflict, hooking a fish to be snatched and fought over, so moved upstream to a steady, shallow glide. I could see the river bed clearly, patched with coloured autumn leaves and flicked the lure under the roots of a tree on the near side. I watched it skip across the debris, and then it disappeared. I couldn’t spot it, and then all went solid; snagged! A small amount of pressure was applied to free the hook and suddenly a huge bow wave erupted as a pike leapt clear of the water in a shower of spray! I hadn’t seen it, perfectly camouflaged as it shot out and whacked the lure, and although it was only a jack of about 4lb, it gave a superb account on ultralight tackle as it sped around the confines of the river, desperately trying to dislodge the hook. Safely netted, it was quickly returned sulkily to the river, and that ended my session. An hour on the river had resulted in a number of handsome perch, a close up encounter with a mink, and a finely conditioned pike to finish; it doesn’t get better than that does it? The new Deeper Sonar Christmas package is available from 1st November (rrp £209), and contains the Deeper sonar, spare night fishing cover, smartphone mount, neoprene carry pouch, charging lead, and a bonus Gerber™ multi-tool with twelve handy functions! Check it out! Thank you to everyone for taking part in the March Dovetail Fishing League. The tournament scores have been counted and we can now reveal the winners of each series and the overall Angler of the Month. Xbox One Angler of the Month: AllegingSumo Series Winners * Big Bass Tour: HONESTANGLER917 * Carp Championship: AllegingSumo * Predator Challenge: perex62 * Match Series: AllegingSumo PlayStation 4 Angler of the Month: nafe1981 **Series Winners ** * Big Bass Tour: kordus04 * Carp Championship: DerLema * Predator Challenge: TokerKato * Match Series: nafe1981 PC Angler of the Month: UndeadFrog Series Winners * Big Bass Tour: UndeadFrog * Carp Championship: H3x1s * Predator Challenge: UndeadFrog * Match Series: UndeadFrog Congratulations to the winners! The April Dovetail Fishing League Season has now started with events on Lake Boulder, Gigantica Main Lake, Lake Johnson and Bergsee kicking us off in week 1. Best of luck to those taking part in April. It’s time to dust off your tackle and see what the Fishing Sim World community can do together with our new Community Challenges launching today. Every month, we will be setting a target for you to collectively take part in, and if the set goal is reached or exceeded, we will release a reward for everyone to download. The first challenge is… Catch 10,000,000 lb’ of any fish from any lake between today and the 26th April. What will be the first reward? 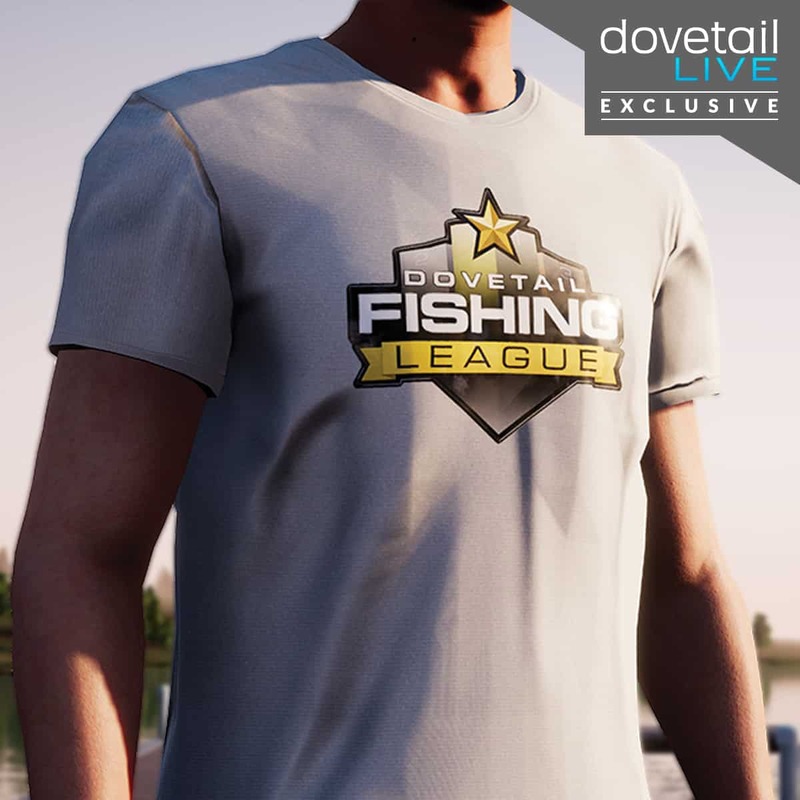 For our first community challenge, the reward will be a super cool white T-Shirt with the Dovetail Fishing League logo on the front. How will I receive my rewards? If the target set by us is reached, the reward can be received by being logged into Dovetail Live within Fishing Sim World; Clicking the online section on the home menu will trigger the download of the T-Shirt in game, the T-Shirt will then be available to you from within the customize and appearance sections of the game. How can I participate? All you have to do is catch some fish in Fishing Sim World on any platform, on any lake, while being signed into Dovetail Live, and your caught fish will be recorded and added to the community weight total. How can I see our progress? A Challenge Tracker will be present on the Dovetail Live website that will regularly update as you and the rest of the community catch. There will also be occasional progress update posts on our Facebook and Twitter pages. After targeting carp last week, I’ve done much the same this week, taking a total of ten double figure fish whilst fishing the ‘tip. Why? In truth, I spent plenty of time during the session taking photographs for clients prior to scheduling on social media, and to accompany other forthcoming copy. As a full time angler and writer, I often have to plan weeks (if not months) in advance, and having a library of relevant images is of vital importance. I fished in company with a mate and was pleased to have a proper ‘subject’ for the required images, rather than the usual ‘selfies’! We storyboarded and took a huge number of images, so the trip was an opportunity to get some ‘in the bag’ for when times are hard and I need a specific image! Having the opportunity to get the images was a great help (thanks Andy!) but I couldn’t help but keep an eye on the weather, looking forwards to a predator session just two days later… I think that pike angling has, over the last few years, definitely become my favourite facet of angling, and at this time of year, it’s just an absolute joy to be on the banks. I wanted to continue my exploration of my single hook theory, so was keen to hit the banks at my favourite Stoke-on-Trent Angling Society club water with a cool bag full of deadbaits, and a head full of ideas! I arrived bright and early, and it turned out to be one of those mornings that leaves you simply stunned… I’ve been trying the single hook rig for a number of reasons, the main one being to offer a way for relatively new pike anglers to safely handle and unhook these fine fish without the anxiety of dealing with a pair of trebles. I know that many anglers would like to catch pike, and although information is readily available, it still boils down the fact that some anglers are terrified of being unable to remove deeply embedded trebles, and as a result, sensibly, have never fished for pike. I want to try and remove that fear from the equation, by proving that a single hook can work, that it has the potential to cause less damage, and is much easier to remove. So far, my findings have been encouraging… My first trial run with Kato circle hooks, purchased in Australia on a whim saw me miss my first run through my own fault, but then hit both subsequent takes, bringing a brace of double figure pike to the bank. Both fish were firmly hooked in the scissors, and because the barb had been crushed with long nosed pliers, both were safely unhooked within seconds; a good start. I wondered whether crushing the barb was enough though, whether things could be made even safer and resolved to try a different, barbless hook pattern. I used the same 35lb PikePro wire, twizzled the trace exactly the same way, and used an identical lead arrangement. The hooks to be used however, were not circle hooks, and this had a huge effect! My first four runs with the new hooks all ended in disappointment, with not a single contact felt with any of the protagonists, and each time, the bait was lost. Not only was I missing bites, I was getting through bait at an alarming rate! I don’t expect to re-use baits, but I don’t want to lose them every cast either! I wondered whether the missed takes resulted from smaller fish picking up baits and dropping them, but my deadbaits were only small roach, so considered this unlikely. Reverting back to the circle pattern immediately saw a double figure fish banked which went some way to proving it was the hook, not the bait size at fault. More food for thought, so another session beckoned… The club venue is padlocked, with entry forbidden before 7am, so just after, I unlocked the gates, and drove up to the car park to unload. All was quiet, despite a breeze being forecast, and as I sorted my gear, I looked across the reservoir to see the breaking dawn mirrored in the still dark waters. Every second brought new colours to the tableau before me, and as the sky lightened, a hazy mist was unveiled on the fields and woodlands surrounding the lake. The fog rolled slowly down onto the water until the sky and water became one; it was hauntingly beautiful, and a sight I’m struggling to describe with mere words… I couldn’t concentrate on setting up as the minutes passed and the scene became even more alluring; rarely have I seen such a stunning morning unfold. As the sun rose, the mist became backlit, and everything was coated in a golden glow. I took some simply superb images, none of which required any filters or editing, and they are already in the printers to go up on the wall! Such beauty instantly put me in a wonderfully good mood, and I couldn’t wait to get started again! Within a few minutes, both rods were tackled up, baits mounted on the circle hooks, and deposited into around fourteen feet of still, dark water. My bobbins were set, alarms switched on, and I sat back to absorb the surroundings. I noted a flock of lapwings wheeling together over the far bank, and high above, a buzzard being harassed by crows which sought to protect their nest. Behind me, a Jay paraded on the high wall, cackling, and I watched rabbits disturb the mist as they warmed up in the weak sunlight. It was one of those perfect mornings, and everywhere I looked, I saw something to delight me… Bleep. A single note grabbed my attention and I watched the white head of the indicator twitch upwards as the rod tip shook. I removed the line from the clip, and as it continued to disappear, wound down and lifted the rod, hoping to connect. I’ve found that a ‘strike’ isn’t required with circle hooks, instead I prefer to just tighten up until I feel the fish, but on this occasion, I felt nothing; the bait came back unmarked too, so I was unsure whether the bait had been picked up, or if the pike had just brushed the line. The roach was recast to the same spot, and as I replaced it in the clip, it pinged out of my fingers as the bait was taken again. Once more, I wound down, and failed to engage with the bait stealer. Retrieving the bait, I inspected it for damage, and again could find none; now I was scratching my head! There was obviously a fish down in the depths, but why wasn’t the hook turning into its jaws, and why wasn’t the bait damaged? I discarded the roach, and threaded the hook into the tail of a new one, ensuring that the hook point was free of any scales, and was still sharp. It went back out into the same area, I felt it hit the lake bed, tightened up, and returned to my enjoyment of the morning. As I poured a mug of tea, another bleep preceded the red light of the alarm, and this time the indicator fell away as the fish moved off. Closing the bale arm, I let the fish run against the tension, then wound down to set the hook; fish on! I could feel instantly that it wasn’t a monster fish, but the pike gave a good account of itself before it slid into the net, the circle hook easily visible in the top jaw. The crushed barb had gone through, so rather than try to reverse the hook hold, it was simply exposed, then snipped off with sidecutters so that the hook fell out. Unhooked without getting my fingers anywhere near those teeth or gill rakers, and without causing any harm to the fish; easy! I missed the next couple of takes, then hit two more, leaving me with four missed, three hit which might not be seen by some as a good return. Personally, I’m not too disappointed. Since using circle hooks, in four sessions I’ve had six double figure fish from eleven runs with all of them safely and easily unhooked without damage, and in two of those instances, I’ve missed them through my own fault, so it could be scored as six from nine which is a better tally. The other hook pattern has so far failed miserably, missing four from four, but I’m considering using a hair rigged bait to see if completely barbless hooks offer even greater ease. I’ve suffered no net traumas either, no flying trebles catching in the mesh, and certainly no deep hooked fish nor awkwardly snared pike with a treble in each jaw. The circle HAVE made things much simpler, and in future, it will be only single hook rigs for me from now on. So, there you have it. My investigations thus far lead me to believe circle hooks are effective, are far easier to remove, and have less potential to cause harm to either me or the predators. If you have never tried pike angling because of a healthy disdain for trebles, then why not check out the Pike Anglers Club handling guidelines, find an experienced angler with whom to go, and try my single hook rig? You may be pleasantly surprised! On my way back from a session elsewhere, I recently checked out a free stretch of the River Trent, hoping to be able to find some areas in which to cast a line, and absorb a little bit of information from any anglers who were there. The stretch in question isn’t that long, and my investigations revealed only a couple of fishable pegs, but it looked nice, so I decided to have a crack at it later in the week…after all, it looked absolutely perfect for dace on the stick float! A few days later, I returned, and was delighted to find that the peg I really fancied was vacant… in fact there were no other anglers to be seen anywhere, so I spent a good few minutes watching the water, spotting the flash of dace over the gravel, and the dark shadows of chub in the deeper water beneath an overhanging willow. I was itching to get started, having heard tales of gudgeon to 1lb 2oz (I know) and roach to 3lb 15oz (!) in addition to big chevins and other monsters! The reality I surmised would be somewhat different, but as I love small river fishing, I quickly got the float rod out and started to tackle up. As I threaded the line through the guides of my rod, I glanced down at my bag to see an empty space. It took me only a few seconds to realise that my session was about to change drastically; I’d forgotten my floats! Ahhhh! I really didn’t fancy fishing the ‘tip for lightening fast dace, but with no other option, I dragged out the leger rod, set up with a 2oz insert to counter the flow, and put out a bit of groundbait upstream to stir things up. A size 16 hook held a couple of maggots, and with the addition of a small bomb, it was gently lobbed out and left to settle. The tip curved around as the flow created resistance, then it pinged back as the lead moved… and moved again… and again. I’d obviously misjudged the current under the willow, so swapped to a gripper lead to give more surface area and greater friction. The rig went back out, and settled nicely… I always struggle to hit dace on the ‘tip, they are just so fast, finicky, and fleet, so it was a case of waiting for a definite pull before striking. I was so off the pace though and missed so many bites, that if I’d been in a gunfight at the OK corral, I’d have had six holes in me before I’d shot myself in the foot through my holster! Eventually, I got into the swing of it, and managed to hit perhaps two thirds of the dace, with a steady stream of nicely conditioned fish soon on the bank. I’d dropped down to a single maggot on a size 18 hook to get better indication, and for the next couple of hours, caught nothing but dace from the swim amassing a reasonable total of shimmering silvers. I continued to bait the swim every few minutes with a nugget of groundbait, and a pinch of maggots, and whilst expecting yet another dace, was surprised by the ferocity of a take which almost had the rod off the rest! Connecting with something much heavier, the rod hooped over as I tried to steer the fish away from a mid-stream snag. I didn’t get chance, the light hooklink parted within a few seconds, but not before I’d seen the golden flanks of a nice chub as it belted away from me, sadly for good! Although I hadn’t hooked any of the big gudgeon (!) a chub was a welcome distraction, and I have to admit I was less than pleased with the lost fish… With chub in the swim, I stepped up the tackle and put on a heavier link, and a bigger size 14 hook. The tail of a worm was added, and it was cast back out into the darkness beneath the tree. I had to wait almost fifteen minutes for the next bite, another lurching wrap around take, and was pleased with a perch in absolutely pristine condition. A few more followed, although sadly no chub which appeared to have been spooked downstream by my loss, and as I contemplated packing up, a flicker of the tip caught my eye, and I watched as it gently trembled… I lifted the rod and winched in a slender sliver of purple and gold… a gudgeon! Not the monster fish I’d had described to me by a fellow piscator (1lb 2oz indeed!) but nonetheless a joy to behold as it’s delicate cloak of colours glistened in the late afternoon sunlight. After a disastrous pollution incident in recent years, the humble gudgeon was a wonderful indicator of a river on the up, of clean water and good times to come. I had a very pleasant day by the riverside, and I’ll certainly visit again, but I’ll try to remember my floats next time… it’s easier to catch dace that way! Sometimes, I think that I lose sight of what angling is all about… a few hours of relaxation, outdoors in pleasant surroundings, with a few fish for company. Instead, I end up taking everything (including the kitchen sink) loading the barrow until my back can’t take any more, and trudging off across the fields to set up photography shots for social media clients, sponsors or whatever, so this week, I went back to my childhood in an attempt to find some joy again, to try and remind myself exactly why I go fishing… I picked up a small two wheel trolley recently, after spotting it going cheap (free in fact) and was determined to thin out my tackle to fit. A bucket doubled up as a seat, I took a zip up unhooking mat with scales, tripod and landing net within, and a small rucksack, which were all bungy-corded to the frame, and I carried my rod bag over my shoulder to travel as light as I could and still get the required images for later in the week. With everything secure, I locked the van, crossed the busy road, and walked off across the meadow to the local canal. I usually take a lure rod and bag of lure kit when I hit the cut, but for the first time in many a year, I wanted to fish it properly, with maggots and everything! The trolley made navigating the meadow easy, and within a few minutes, I’d arrived at my destination, a boat turning area, to find I was the only angler in sight; perfect. Quickly spying a grassed area off the towpath, and therefore out of the way of speedy lycra-clad fitness freaks on wheels and nosey dogs, I parked the trolley, and removed my 11’ float rod, which was quickly twinned with a 3000 series reel, both from the Sonik stable. Whilst preparing, I threw in a handful of maggots and a small nugget of groundbait, before selecting a canal dart float, and tackling up, attaching a size 16 hook to nylon. A plummet was slipped over the hook and lowered into the track to see just how deep it was. I found about 3’ of water, shallowing off quickly little more than a couple of rod lengths from the bank, and a pronounced hole where boatowners obviously gunned their engine to swing the boats around before retracing their steps. The extra power had stirred a clearly defined depression, so I was keen to target a definite feature as canals can often be devoid of anything to attract fish in certain areas! I plumbed up an inch or so over depth and added a number 8 shot to drag the bottom and keep the float still; otherwise, it was dotted down to show less than an inch of bright red tip. A pair of maggots were nicked onto the hook, and the rig was swung out, line sunk, and I sat on my bucket like a chubby garden gnome to see what was within the swim. I had less than a minute to wait, the float lurching as a fish picked up the bait before sliding away. Surprised by the speed of response, I missed it, so dropped the float back in and watched as it failed to settle. I deduced that the maggots had been taken on the drop and was pleased to feel a small fish hooked when I lifted the rod. A plump silvery roach of a few ounces was the result, and I was pleased with that! After an hour, during which I’d continually flicked in odd maggots and yet more groundbait, a trio of boats had added colour to the swim and I’d picked off a steady number of fish as the float repeatedly slipped under. Most were roach, some as tiny as an ounce, others almost half a pound, before I hooked into the first of series of chunky hybrids all over the pound mark. After two hours, my total bag stood at around fifteen pounds, maybe more, and I then started to pick up perch, obviously attracted by prey fish in the swim. I had noted perch striking at fish elsewhere in the swim but had only caught tiny sergeants before the first of a better stamp of fish appeared. I spent three hours at the bank side, sharing it with a swimming grass snake, a constantly darting kingfisher, and a gaggle of elderly walkers who wanted to watch for a while, and do you know what? I thoroughly enjoyed it! A short session haul of perhaps 25lb from any canal is not to be sniffed at, and I was very surprised to find out that plenty of the fish were of some quality too, and it helped me see that fishing IS about fun, not Facebook ‘likes’ or constantly bombarding other anglers with social media posts, but instead is about nature, solitude, and a bit of time away from the hustle and bustle of everyday life. Sometimes, I think it fair to say that many anglers forget that, and sometimes lose their focus… I know I do, but now when I feel a bit jaded, I think a trip to the canal, with a pint of maggots and some floats will refresh my mind… just like when I was a kid! The trolling motor helps you find the perfect spot to catch fish on our American lakes. 1. Find your spot Find a place on the lake where there is a lot of activity on the fish finder. If you are travelling at speed you will need to retrace your route to find the location of the fish. 2. Deploy the trolling motor When you have found your spot, drop the trolling motor into the water using the right stick. To access the controls for the trolling motor you will need to hold the A button. With A held: * Use the up and down buttons on the d-pad to adjust the speed of the trolling motor * Use the left and right buttons on the d-pad to adjust the direction of the motor 3. Locate a cluster of fish Using the trolling motor controls, navigate your boat to an area which shows a cluster of fish on the fish finder. 4. Cast out and start catching Cast out and start trying to catch the fish. Gigantica has been fittingly named, to represent the huge carp that swim within its crystal clear depths. This lake is a real test of your angling ability, you will need to be alert and have the right equipment to avoid being caught out here. The carp top out at over 86lbs with the famous trophy fish, Fudgies. Species present Mirror Carp, Leather Carp, Common Carp, Northern Pike, Perch, Roach, Rudd Lake records * Mirror Carp – 86lb 5oz * Common Carp – 76lb 3oz * Leather Carp – 55lb 8oz Oblivion, Pole Position, Alcatraz and Co's Point have been known to provide great results here.